Encouraged by her sister Katherine's success, Marjorie Stinson decided to learn to fly in June of 1914. With her mother's permission at the age of 18 she enrolled in the Wright School at Dayton, soloed on August 4, and received her license on August 12. After an unsuccessful attempt to establish an airmail route in Texas, Stinson joined her family in establishing a flight school in San Antonio. Stinson was an instructor, along with Katherine; her brother Edward acted as chief mechanic, and their mother became the business manager. 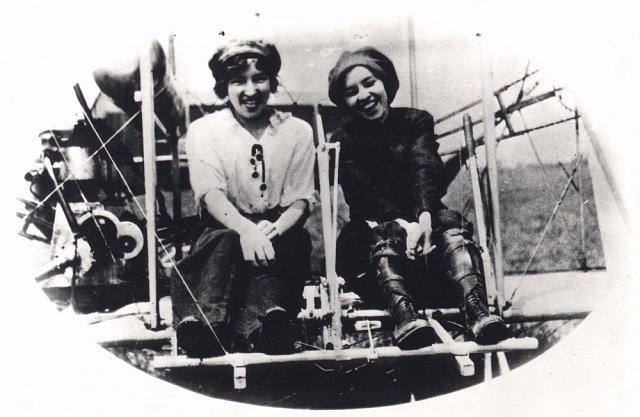 Stinson was inducted into the U.S. Aviation Reserve Crops, as its only woman, in 1915. In 1916, with the war in Europe raging, the Royal Canadian Flying Corps began sending their cadets to the Stinson School for training. Stinson became known as "The Flying Schoolmarm" and her students as "The Texas Escadrille." The school closed at the end of the war in 1918 and Stinson became a draftsman with the Aeronautical Division of the U.S. Navy.